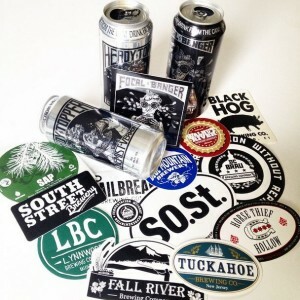 Promotional stickers have become essential tool in the growth of craft brewers. Stickers are a great, low cost way to help increase exposure and market any brewery. They build identity, create word of mouth, and grow sales. Here are a few ways Brewers are incorporating stickers into their marketing programs. For increased exposure at a low cost many breweries hand out stickers (or make them available) free to all patrons and fans. When you think about how far a brand can travel once given to an enthusiastic customer/fan and stuck on their car, water bottle, cooler, laptop computer, or beer fridge/cooler, you’ll understand. Stickers are mini billboards shouting the Brewery’s name and starting conversations. Done right, the stickers are a badge that customers will gladly wear with pride (and you don’t even have to pay them to do it – they WANT to)! Here’s a quick list of some other ways breweries are utilizing stickers. Of course, there are other ways creative beer companies are utilizing stickers. For example several companies use a sticker to attract people to their booths and start conversations at beer festivals and special events. 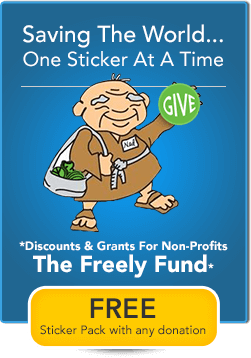 They have a roving representative handing out stickers or sticking them on people (with permission) at the booth – then they make it worth their while to wear the sticker by offering a free gift, a coupon, an express lane, a bigger sample, etc. As people walk around with the sticker – the branding – the fun message, they are starting conversations and openly recommending and directing people towards that breweries offerings. Of course, it is essential to not upset the show venue with stickers that might become litter or graffiti. Need more ideas? Websticker not only helps breweries increase exposure and sales with well designed stickers, but hundreds of different businesses and industries benefit from their sticker design, production and marketing expertise. With such a plethora of beer choices out there, this is just another way to influence people to give your beer a try. The more your sticker is seen, the more people are intrigued by the brand and will want to know more. If your beer is already heavily sought after, it is a great way for your following to show their enthusiasm for your brand.